The MPL4140B is a DRAM memory card, compatible with the G-64/96 bus. 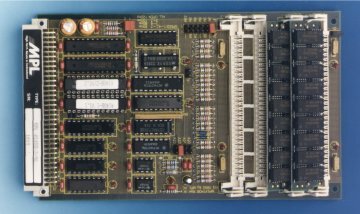 It provides 4 single in line module sockets for 1 Mbyte, 4 Mbyte and 16 Mbyte single in line memory modules (SIMM) up to a maximum of 32Mbyte. The bank selection and address range adjustment is easily made with a few jumpers.